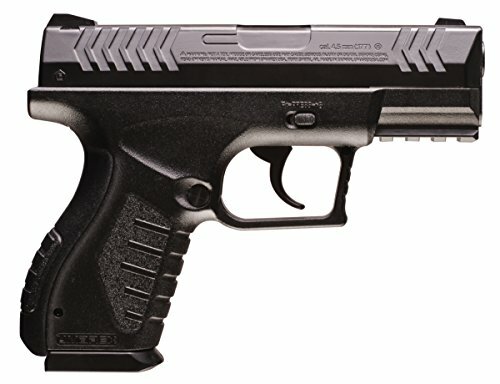 BB guns have technologically innovated in the past several years. In fact, high-end firearm manufacturers like Dan Wesson, SIG Sauer, Colt & Smith & Wesson are licensing and creating bb gun replicas. Make sure you understand the difference between bb guns and Airsoft guns- they're totally different. While Airsoft guns shoot plastic, a bb gun shoots .177 caliber steel. As well, the former requires an orange tip as a safety distinction, while the latter don't require an orange safety highlight. As well, Airsoft options are meant for competitive play- shooting at each other. 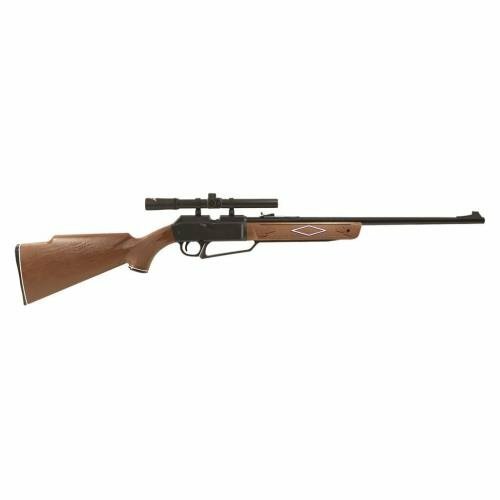 While bb guns are meant for hunting, plinking or target shooting. 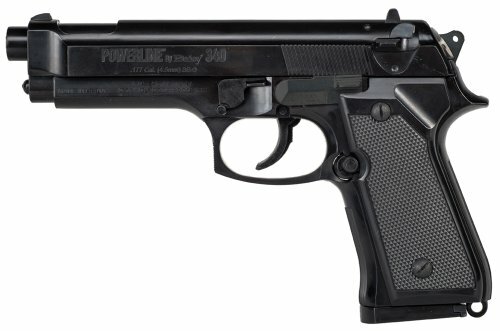 The PowerLine 340 BB pistol is a spring-air pistol that features a 200-shot BB reservoir with a 13-shot Speedload Clip. The removable Speedload Clip is located in the grip. 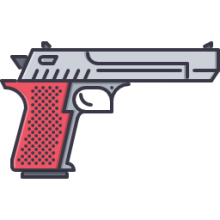 Once the reservoir is loaded with 200 BBs, you just pull the Speedload Clip tab all the way out, shake the pistol and push the tab back in to reload the Speedload Clip without removing the magazine. It is very often said that “BB” is originated from “bullet ball” or “ball bearing” but actually this is not true. BB guns have historically utilized BB-sized shotgun lead shot pellets, in between size B and size BBB. BB shot is 4.57 mm in diameter but it varies considerably in sizes- owing to the allowable tolerances of higher nature the use of the shotgun shell. In the year 1900, Daisy, the earliest makers of the oldest types of BB guns, altered the bore of BB gun diameter to 4.45 mm and started to make marketing precision-made shot made of lead especially for guns. They termed it “air rifle shot”, but in the meanwhile, the name “BB” was already established and all began to call the guns as “BB guns” and for the shot, it became “BB shot” or simply “BBs”. 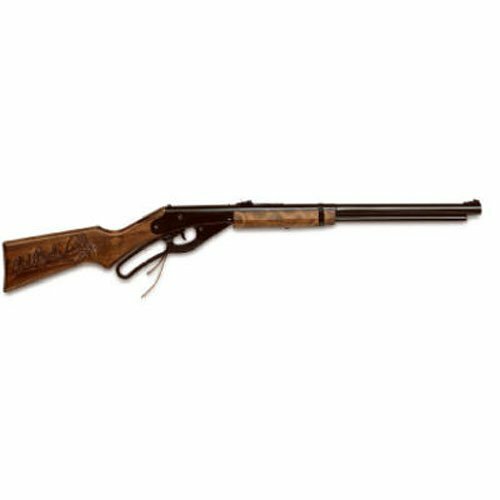 In the year 1887 C. Hamilton who was the inventor of .22 rimfire, introduced a metal-air gun. As he was demonstrating his new invention in front of the local industrialist, Mr. Lewis Cass Hough, he exclaimed in surprise ‘That’s a daisy!’. The design of the air gun was so clever that lead BB shots were also compatible. This special feature made Mr. Lewis Cass Hough commission production of hundreds of the little air guns in the year 1888. As the air guns gained popularity, Mr. Lewis Cass Hough’s iron mill began to produce these lead birdshot guns in full fledge under the name of Daisy’s BB guns. The windmill company of Mr. Lewis Cass Hough reincorporated in the year 1895 as The Daisy Manufacturing Company and still continues production under the same name. Until the early years of the twentieth century, the lead BB shots were used as the projectiles for the Daisy gun. Later on, Daisy started manufacturing its own lead shots that were smaller than the original ones and around 0.175 inches in diameter. These lead shots were exclusively the property of the Daisy Company and kids were to buy them from the company directly. With the reduction in the size of the new lead projectiles of the BB gun, there was an increase in the velocity of the projectile. This facilitated the use of spring wire that was smaller in diameter. This made the guns fire the projectiles with the same velocity and also cocked easily. In the year 1920, Daisy started receiving some reports from clients of BB weapon expelling metal balls of scrap steel. Consequently numerous firearms started to come in for repair with torn apart part barrels. American Ball Company promptly took the risk of it as a promotional opportunity. They started dealing BB shot with breadth of 0.171 millimeters to 0.173 millimeters for air rifles made of steel. This promptly brought about an advertising understanding of selective nature with Daisy as ground steel BBs of exactness nature were modest in regard to lead BBs of accuracy nature. The light sort of steel BBs likewise created higher speeds in contrast with lead BBs, which brought about weapons of new kind shoot all the more precisely in short ranges where they looked powerful. In the year 1939, the American Ball Company was obtained by Daisy and it started to secure its own particular BBs. Since Daisy had the syndication in the market of weapon; different creators started to impersonate him by coordinating the drag distance across like Daisy and changing over to 4.55 mm steel BBs. In the later stage, “BB” transformed into kind of more broad nature identifying with now and then non-round sort of shot and the round sort of shot of various materials and bores. It ought to be remembered that it will be in fact wrong if the name “metal roller” is utilized for any kind of steel ball. This is the concise history of BB firearms. When you are extremely enthusiastic about preparing out your shooting abilities then BB firearms from Airsoft come highly recommended. These BB weapons are totally safe to use, however, it is mandatory for you to be over 18 years old if you’re trying to purchase this firearm. These Airsoft, BB weapons utilize BB pellets for home target practice. There are a couple of things of which you have to keep in mind so that you don’t hurt anybody and in addition yourself. In the 1880s, people were buying these novelty guns because they were en vogue. Nowadays, their appeal is returning- it’s a fun sport, though they have a bad reputation in inner cities where police can confuse them for actual weapons. Some people even create DIY options- however it requires a considerable measure of technical exertion and exactness. Truth be told using it at home requires an investment in safety protocol- they really aren’t ideal for children under the age of 18. This option is air-powered. Its magazine holds 420mm BBs. This Airsoft firearm is completely programmed and fires at 235fps. You can supplement with a 850BB explosive speed loader, with an extendable stock, if you need a speedy draw. The SA80 is another popular option. It’s an exact duplicate of a British Armed Forces rifle. It’s a single shot rifle with a limit of 24 BB in its magazine. This is availble in two shades orange and dark. Its weight is roughly 2019g.